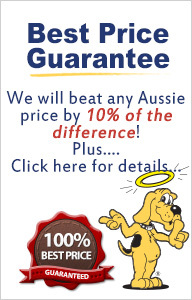 We'll Beat any Aussie Competitor's Price! Here at The Dog Line, we guarantee that our prices either match the prices of competitor’s or beat them. We also offer a lot of other Reasons to Buy besides a price match guarantee. If you see an Australian competitor having lower prices than us, simply fill in the form below with all the details and we’ll beat their price! On top of that, we will give you an *exclusive 10% discount of the difference between the prices plus a FREE GIFT for your dog! To make the deal even sweeter for you, we'll also take into consideration the postage on the final price of the item! Fill in the form below and we'll contact you for your 10% discount! * Link to the Product you found and other details.